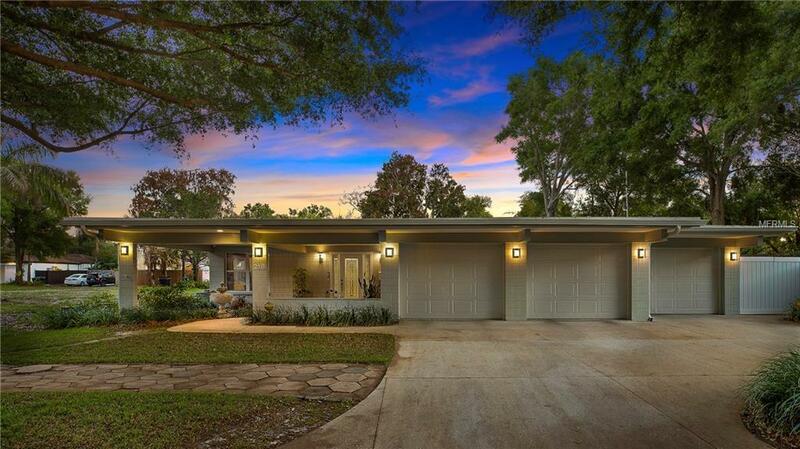 An Old Northeast treasure, this genuine mid-century modern, 1-story home of historical significance was designed by celebrated architect Bill Harvard and built by George Turner, Jr. It has been beautifully updated and in the same family since it was built in 1957. Situated on two lots (100x127) at the end of a rare Old Northeast cul-de-sac, this home faces a side wall of Sunken Gardens - a tropical oasis in the middle of vibrant St. Petersburg! The chefs kitchen boasts genuine white granite from India and a wrap-around dining bar with seating for six. Features include a family room which opens to the state-of-the-art kitchen, and a separate dining room plus sitting room. One of the four bedrooms is currently used as a spacious office and workout room. Youll love the natural light streaming through sky-tubes and skylights. Roof is new February 2018! Ample storage (an entire room off the garage!) and California Closets in all four bedrooms and hall closet. Expansive screened porch provides plenty of room for entertaining, family fun or peaceful relaxation. Completing this home is a 3-car garage with room for a workshop.